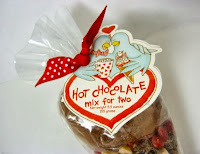 Today was Day #7 of Chocolate and Hemp Theme Week, and Day #1 of Chocolate and Cinnamon Theme Week. 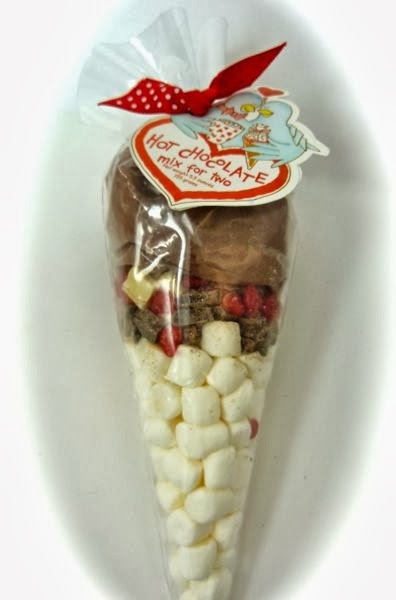 The chocolate that brought these two converging theme weeks together was a cone-shaped package of "Hot Chocolate for Two" from Pelican Bay Ltd (Dunedin, FL). This hot cocoa was a perfect choice for one of the first cold evenings of the fall. Complete with miniature marshmallows and red cinnamon-flavored candies, all this cocoa mix (powder with dark chocolate chunks) needed was some hot liquid. "How about trying a milk alternative?" I thought. Maybe some hemp milk? I remember hemp milk being one of the better tasting fake milks ("filks")* after trying some a several months ago. *Note: Warm these filks with caution (or mix with half cow's milk initially), as heating up these alternative milks can shift flavors. Brands and formulations vary.